Special Promotions 5% OFF on this product. Use coupon code CRBAY5 at checkout. Limited time only. We are the first one to publish 420°C high temperature nozzle to 3d printer market since year of 2016, now it is the 4th new tech version. 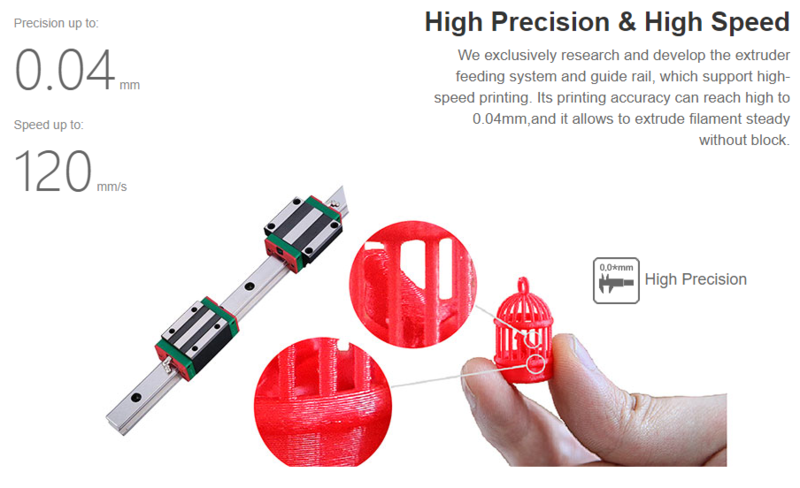 F430 equiped with dual extruders, The left 260°C hotend is able to print with PLA, ABS, PC, Nylon, Carbon fiber, Flexible, etc. The right 420°C hotend is made of martensite steel, which is able to print High performance material like PEEK, ULTEM, etc. The dual hotend is replaceable, which provide more possibility on your application. 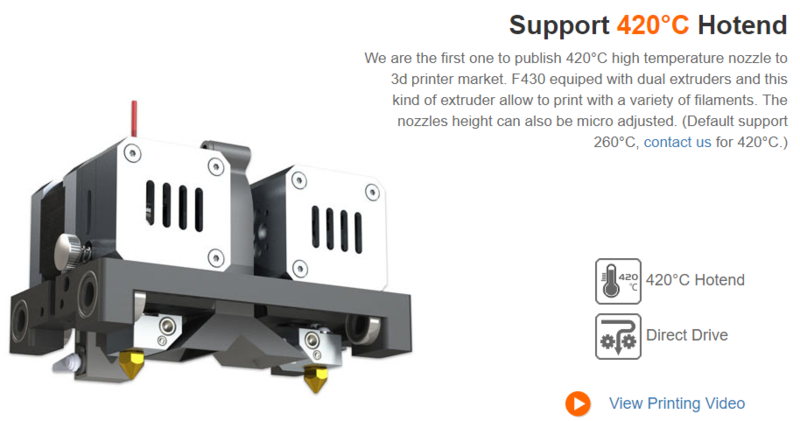 The nozzles’ height can also be micro adjusted and the printer has a build volume of 400mm x 300mm x 300mm. The extruder feeding system supports high-speed printing. 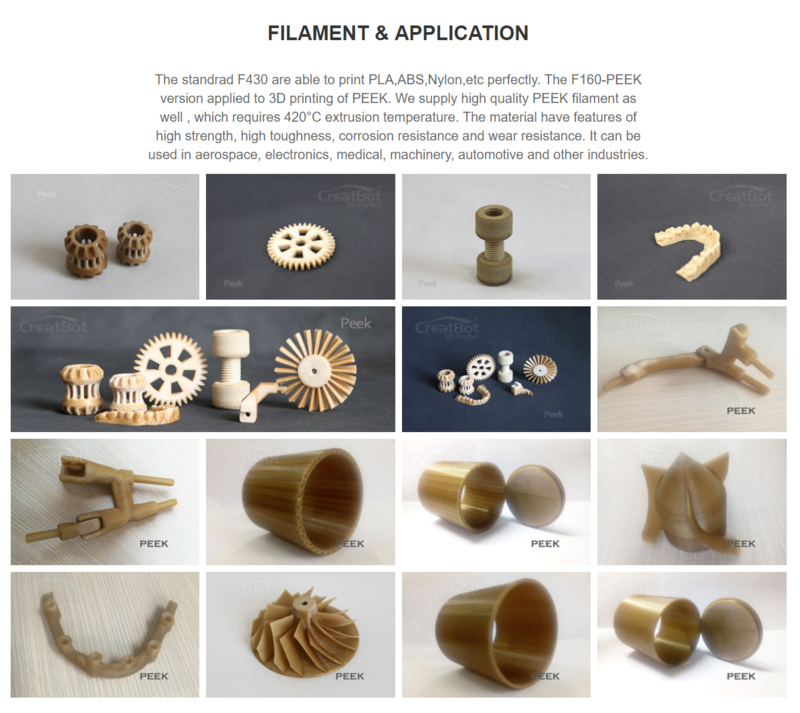 The high-speed will not affect the filament and it will extrude steadily without blocking. 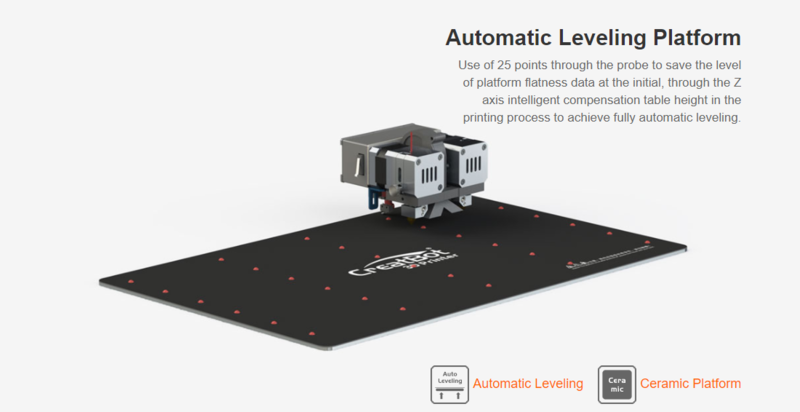 The printing is also highly accurate with a 0.04mm print resolution. 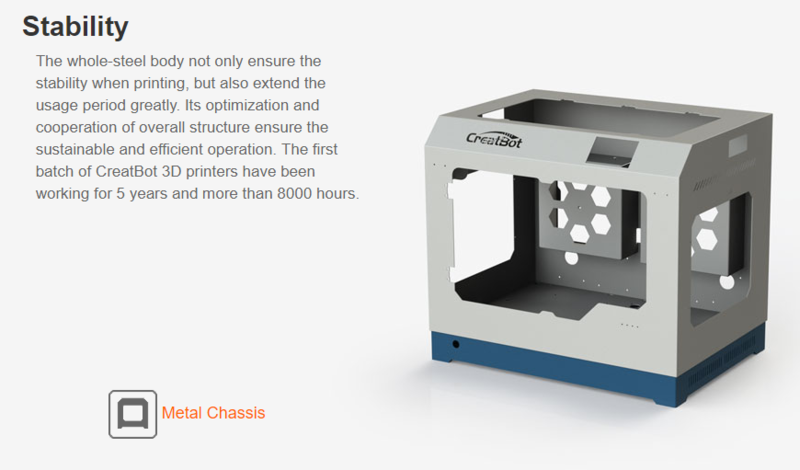 The printer’s steel body not only ensures its stability when printing but also extends its usage period greatly. 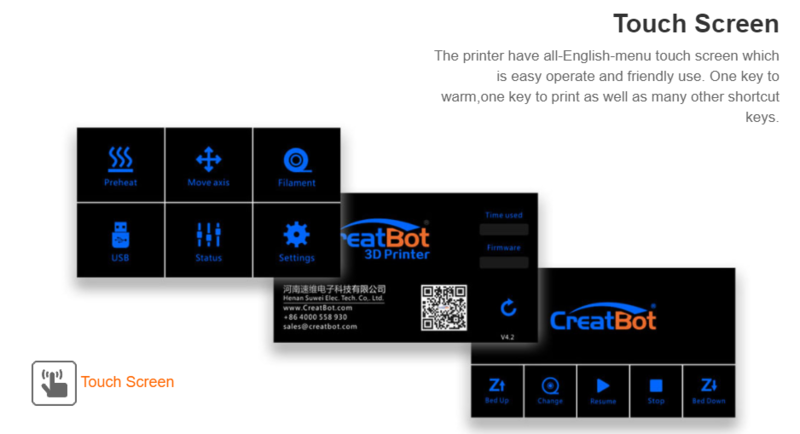 The first batch of CreatBot 3D printers has been working for 5 years and over 8000 hours. The fully enclosed chamber can block all external interference and reduce noise. 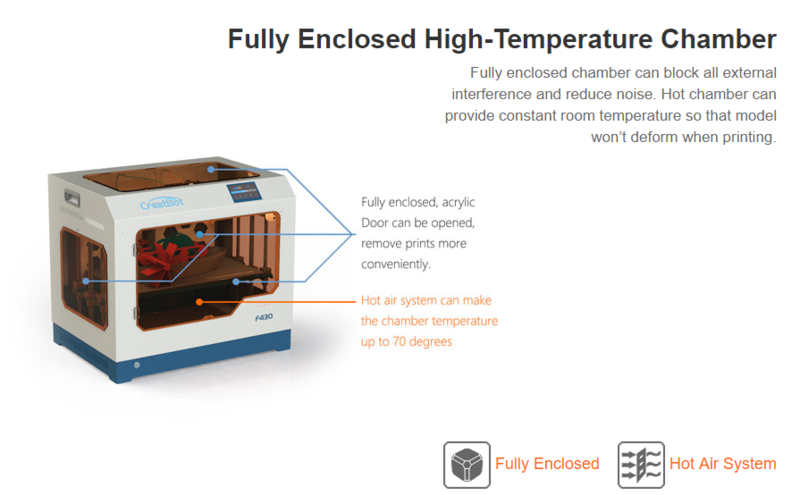 The hot chamber can remain at room temperature so that the model won’t deform while printing. 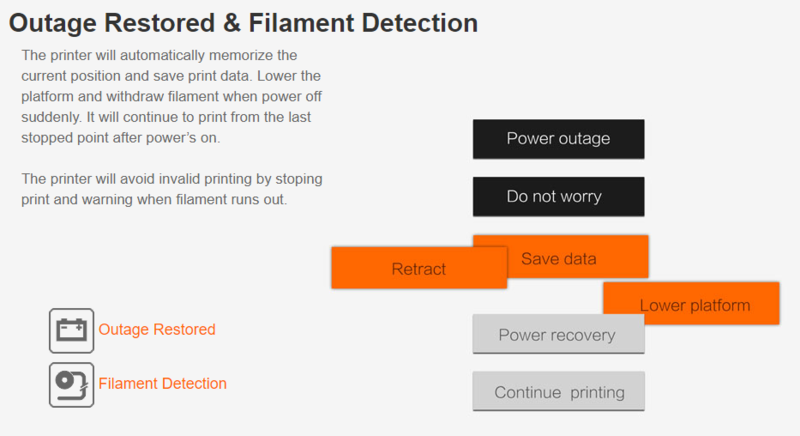 The printer will automatically memorize the current position and save print data if there is a power outage. It will continue to print from where it stopped once the power comes back on. The printer will avoid invalid printing by stopping the printing process when the filament runs out. The printer has an English menu touchscreen which is easy to operate. There is one key to warm the printer up, one key to print and many other shortcut keys. 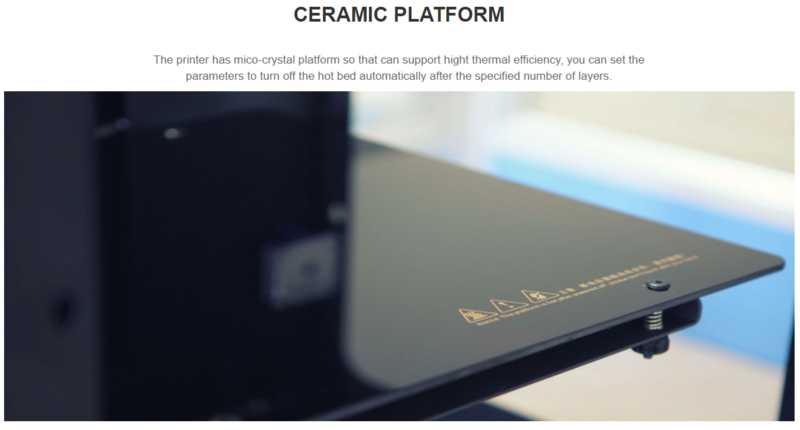 The hotbed is made of heatable aluminium PCB, which can heat up to 130°C. The platform is attached using 3D printing stickers called buildtak. Printed objects can be stuck on the buildtak tightly and won’t become deformed. The hotbed is attached to the printer with a carbon fibre panel, which allows heat to transfer fast. The carbon fibre panel is removable and you can bend the panel with both hands and get your 3D object out easily. The air filter system can absorb impurities and gases that are generated by printing special filament. This gives the environment that the printer is located protection which means it is suitable for use in the home, school or office space. It's a great fabulous workhorse 3D Printer. Producing astonishing industrial grade quality prints. You can almost print anything with its 420 degree Celsius hot end.